About a week ago, my request for a month-long Schengen Visa as a tourist was approved by the Switzerland Embassy, and I just loved how the application process was so swift and streamlined! This trip to Europe is actually a ‘last minute’ kind of thing. My intended departure was just 2 weeks away, therefore I was a bit anxious if I will make it on time. Thankfully, the Swiss Embassy’s processing time is fast — in just 3 days, they have already given me my result. That being said, I’m super excited to finally see Switzerland! I say ‘finally‘ because on my 1st ever trip to Europe, I was supposed to make a stop here during a road trip spree; but plans changed and I didn’t manage to push through with it. When I was finally living in Belgium, I never really had the chance to stop by Switzerland either because I was too swamped with sudden trips as well as work. That’s why, I’m very glad that I’m going to see it soon! It helps to note, however, that I’m not going to stay in Switzerland for the whole month that I’m in Europe because I’m also planning on making the most of my stay as I visit other places like Monaco, France, Italy, Portugal and Belgium! So if you want to get your Schengen Visa via the Switzerland Embassy as well, I hope that my visa application guide below can be of help to you. – NO ONE can give you the guarantee of your Schengen Visa’s approval — not even a lawyer, a consultant, a travel agent, or an embassy employee. Anyone who says otherwise is most likely going to be a scammer. So what I’m rather offering you here is a comprehensive guide with helpful tips to increase your chances of getting that visa. Nothing more, nothing less. – There are different types of Schengen Visas (for fiance, work, study, etc.) but my main focus for this article will be a Schengen Visa for Tourism purposes only. To see a list of requirements for other types of visas for Switzerland, go here. – Take note that additional documents could be asked from you if the Embassy deems it so; and of course, initial requirements might also change over time after this post’s publish date, so it’s best that you check the Embassy’s main website as well which is located here. » What is a Schengen Visa? NOTE: It helps to mention that there are non-Schengen members in Europe that allow entry to their country if you have a Schengen Visa, namely: Albania, Bosnia and Herzegovina, Bulgaria, Croatia, Cyprus, Macedonia, Monaco, Montenegro, Romania, San Marino, Serbia, Turkey, and Vatican City. HOWEVER, you must check these details beforehand since their rules might have changed. Plus, customarily, only multiple-entry Schengen visas are allowed. You can check this list for more details and updates. » When should I apply for a Schengen Visa? Apply as early as three (3) months or 90 days before your planned trip date departure. You can apply several days before your trip, sure — but it’s always best that you give enough time for the embassy to look into your application. After all, you wouldn’t want to make plans only to have the embassy provide you with a visa which has a validity period that’s NOT within your intended travel dates. » Where to apply for a Schengen Visa? For Schengen Visas that have a main purpose of visiting a friend/family/national or reuniting with a fiancé/husband/etc. in a Schengen state, naturally, you should apply in the corresponding Embassy of the country where that person comes from. Meanwhile, if you are planning to visit several Schengen Countries for your trip, your application must be made at the embassy of the main destination country — meaning, the country where you will be staying the longest. If the length of stay is almost the same, it’s best to apply for the country that you will first fly or enter to. For my case, I determined that I had to apply at the Switzerland Embassy because I will not only be staying in their country the longest, but my first point of entry will also be in their territory. » Which Schengen embassy will I have a better chance of getting a Visa? » How long does it take for Schengen Visa results to be released? It can surely take longer if they need more documents or details from you. Step 1: Determine the type of Schengen Visa that you need to apply for. There are, of course, various types of Schengen Visas out there that you can apply for: a visa for family reunification, a visa for studying, a visa for work, a visa for transit, a visa for being a spouse, etc. For this particular guide, I will only be discussing the requirements for a tourist visa since it’s an experience that I’ve gone through myself. (I will also include visit visa information since it’s almost similar to a tourist visa). If, however, you have a different situation or purpose of visit, it’s best that you head over to this page of the Embassy of Switzerland in the Philippines for more information. Given the number of people who apply for visas, it’s best to book an appointment first so that you can secure the earliest schedule that’s best for you. You will be lead to a registration page where you need to create your own TLScontact account. Provide your email address, set a password, check the box that says ‘I agree with terms and condition of service’ and click ‘Create‘. You will receive an activation code via email to confirm this registration. Go to your email and click on the confirmation link sent by TLScontact to you. Your account is now activated. Click ‘Log in’ and enter the email and password that you set up. Make sure that you picked the correct type of visa you’re applying for. Under ‘Visa Type & Travel Purpose‘ click ‘Choose’ and choose either Tourism or Visitor (this is when you have a Swiss guarantor or sponsor that you plan to visit). You can save it as draft and modify it later if in case you’re still missing some information for your visa application. However, please take note that it can only hold your information for up to 15 days — if you don’t submit or confirm and set your appointment within those days, your data will be automatically deleted and you’ll need to make a new registration again. If you’re traveling together with family members or with friends, it is mandatory to have ALL applications in the same group. So after you finish inputting your data, you can add your other companion’s data by clicking ‘Add an applicant‘. Once you have input all the necessary information, click ‘Done‘. Under step 2 (Validation), click ‘Confirm’. Remember that once you click this, you will not be able to add applicants or change any of the information anymore. A new registration will be necessary if you need to change any information. At this point, you can download the filled Schengen Form(s) which will be one of the documents that you’ll need to submit. Under step 3, the page will show you a list of available application time slots at TLScontact for deposition your application. Pick the date and time that’s best for you and then print the confirmation page of this schedule. TLScontact will show a list of the documents that you need to submit. On your schedule with them, you need to give those documents in the proper order that they want. From what I’ve noticed, Schengen Visa requirements are almost similar, but with only a few tweaks or changes; so, you must ensure that you follow and provide everything that the Switzerland Embassy requires. Now, depending on your circumstance, click the symbol ‘+‘ below to view the corresponding requirements for each section and the proper order that they need to be in. Make sure that you have authentic, original, and complete documents at all times. For the copies, you must submit them in A4 paper format. 2 Passport-sized Photos. These photos must be identical and in color on a white background. It must also be recent (less than 6 months old) and taken from the front without obstruction; hence, it must be a close­-up of your head and the top of your shoulders so that your face takes up 70­-80% of the photograph. The size must be around 3.5 cm x 4.5 cm. Philippine Passport. Make sure that it is valid at least three months after the end of the planned stay in Switzerland or another Schengen Member State, and that it has at least 2 blank pages to affix the visa sticker. Philippine Passport, copy. You must photocopy the first page containing your personal information, as well as ALL the additional pages which contains visas and stamps that are both valid and expired. Also ensure that you photocopied the back or last page that contains important reminders, signature and other passport information. Old Passport(s). Previous passport(s) or any used or expired passport(s). Old Passport(s), copy. You must photocopy the first page containing your personal information, as well as ALL the additional pages which contains visas and stamps that are both valid and expired. Also ensure that you photocopied the back or last page that contains important reminders, signature and other passport information. Paramount Life and General Insurance Co.
PNB General Insurers Standard Insurance Co.
UCPB General Insurance Co. Inc.
Roundtrip Flight Ticket Reservation, copy. Do NOT buy flight tickets before the visa is issued because the Switzerland Embassy would NOT take any responsibility for the costs you’ll incur if your visa gets denied or if your departure times get changed. So — just simply supply a confirmed reservation only. You can get a reservation typically from the airline itself or through a travel agency, just call them up (example: I got a reservation from Etihad). In case you’re wondering where to look for the best flight deals, my go-to platforms are Momondo, Kayak, and Skyscanner. Proof of Accommodation, copy(ies). These are confirmed hotel reservation(s) only for the entire duration of your stay in the Schengen countries containing the name and contact details of the hotel(s). I usually reserve my hotel stays via Booking.com and/or Agoda.com. With them, you can reserve a hotel with NO pre-payment and you can even cancel the booking a day before your arrival with NO cancellation charges at all. So yes, you can make reservations without any payment, you can change the reservation anytime, and you can cancel them at no cost as well if in case your visa is not approved. Day-to-day Travel Itinerary. At this part, it’s good practice to include a cover letter along with this itinerary document so that you can properly explain the purpose of your trip. 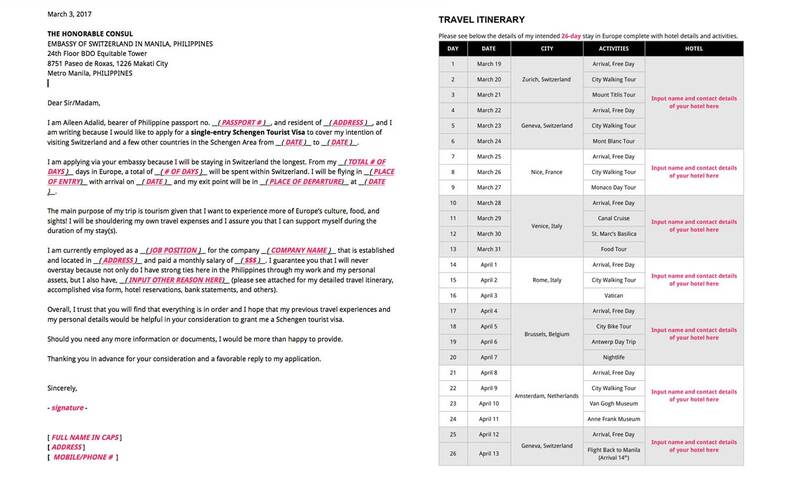 Here’s a sample cover letter and travel itinerary (you can download the file here). If employed: Certificate of Employment, original. This must be from your employer, printed on official company paper with header, signature, date and other details such as: address, telephone and fax numbers of the company, your name, position, annual salary and years of service, and approved leave of absence. Rest assured, the Switzerland Embassy will return your original documents. Personal Bank Statements, original AND copy. You can request this from your bank and it should show the cash flow for the past six (6) months. (If you have a credit card, provide credit card statements for the last 6 months as well). If married or traveling with spouse: Marriage Certificate, original AND copy. *For spouses of Swiss / EU / EFTA nationals, other than the marriage contract, you must also provide a family book or any other document proving relationship, which must be issued by a Schengen / EU / EFTA member country. A copy of the family member’s passport and/or ID card must also be provided. If studying: Student Certificate, original. This is your proof of enrolment and it should mention a leave of absence from school (if you’re travelling while classes are ongoing). For a minor: Birth Certificate, original AND copy. *For children under 21 years old of Swiss / EU / EFTA nationals, other than the birth certificate, you must also provide a family book or any other document proving relationship, which must be issued by a Schengen / EU / EFTA member country. A copy of the family member’s passport and/or ID card must also be provided. Alien Certificate of Registration (ACR) & Re-Entry Permit, copy. This is ONLY if you’re a foreign national who has a valid residence in the Philippines. Simply submit the requirements listed in section (A), numbers #1 to #18 (as applicable). Now of course, when it comes to (#14) Personal Bank Statements, ask these from your guarantor/sponsor — such could be your mom, dad, brother, sister, friend, boyfriend, girlfriend, relative, a sponsoring company, etc. NOTE: If your sponsor values his/her privacy, he/she has the option of sending his/her financial documents directly to the Embassy and he can do this by post or e-mail (instead of you submitting them to TLScontact on your appointment date). If studying: Student Certificate, original. This iSimply submit the requirements listed in section (A), numbers #1 to #18 (as applicable). Now of course, when it comes to (#14) Personal Bank Statements, ask these from your Swiss guarantor/sponsor — this person can be your mom, dad, brother, sister, friend, boyfriend, girlfriend, relative, etc. Additional Questionnaire. This will actually be given to you during your appointment at TLScontact. Make sure that you fill out this form completely and truthfully and then submit it together with your other required documents. Invitation Letter. Your sponsor/guarantor must indicate in a signed letter: your general information (name, birth date, exact address, relationship), his/her details (name and exact address), confirmation and reason of invitation, your duration of stay, and proof of accommodation. Photocopy of Guarantor/Sponsor’s Passport. It must be a valid passport. Simply submit the requirements listed in section (A), numbers #1 to #18 (as applicable). Now of course, when it comes to (#14) Personal Bank Statements, ask these from your guarantor/sponsor in Switzerland — which can be your family, relative or friend. Photocopy of Guarantor/Sponsor’s Passport or Residence Permit in Switzerland. If applicable, include copies of the passport pages of your guarantor/sponsor’s entry and exit stamps from the Philippines. IMPORTANT: In some cases, the Switzerland Embassy may ask a “Declaration of Sponsorship‘ after they check your documents. This form is something that you must send to your guarantor/sponsor/host in Switzerland who then has to process it with the cantonal authorities in his/her area of residence (this usually takes 3-4 weeks). For more information about this Declaration of Sponsorship, visit this website. NOTE: If in case you are a Philippine national living or residing in a foreign country and you wish to avail a Schengen tourist visa, kindly inquire with the appropriate Schengen Embassy in the country that you’re living in about the requirements and procedures that you need to take. (It’s highly likely that the it will be the same). Also, the Switzerland Embassy may request for more information or additional documents in order to verify the contents and truthfulness of the documents you’ve submitted; so, be prepared for that.. Arrival and waiting period. Once you arrive at the 7th floor where TLScontact’s office is located, the security guard will confirm that you have an appointment and then he/she will instruct you to shut down your mobile phone. Afterwards, you’ll be ushered to the waiting area and advice you to wait for your name to be called (which will be flashed on the TV screen above you). It took about half an hour before my name popped up. Submission of documents. The screen will indicate the counter you will have to go to. In there, a TLScontact staff will check the documents that you prepared and then ensure that everything is complete. Like I mentioned previously, make sure that your documents are arranged in the right order. If in case you have any missing documents, the staff will inform you about that. He/she will give you the option to reschedule your appointment so that you can submit ALL complete documents — or give you the other option of just submitting it and understanding that your application can be refused because of the incompleteness of your documents. The person will provide you with a document called as ‘Application Checklist’. Keep this because this is something you’ll have to present when you will claim your passport later on. Payment. This must be paid in cash and it helps to prepare the exact amount in Philippine peso only. There’s NO visa fee for children below 6 years old. Be advised that payment of these fees is NOT a guarantee that the visa will be granted. It also helps to note that these are non-refundable and non-transferable if your application is denied or if you decide to terminate your application. Biometrics. All Schengen embassies in the Philippines have to capture your biometric data (finger scans and portrait photo) and it will be kept in the Visa Information System (VIS) for 5 years. Personal appearance and fingerprint scan is NOT necessary for children under the age of 12, and adults 80 years old above. Do NOT wear colored or magnifying contact lenses which could alter your appearance. Your payment (visa + service fee) is sent through post/courier along with your documents. For the return of your passport, include Php 180.00 on your postal payment or provide a prepaid LBC pouch. The Swiss Embassy still reserves the right to ask you to appear for a personal interview after checking your visa application. Once the Switzerland Embassy is done assessing your application, they will send back your passport and your other original documents to TLScontact. Consecutively, TLScontact will email you to notify you that you can now pick it all up. NOTE: Please don’t inquire with TLScontact if your application has been approved OR denied because they would NOT know the results themselves. (Just think of them as a middleman between you and the Embassy). Claiming of your passport can be done between 13:30PM to 16:30PM, Monday to Friday except holidays. Naturally, the Siwtzerland Embassy will NOT assume any responsibility if your visa application be rejected. And if it does get rejected, you will be given an information sheet that shows the procedures you can take in order to ask for an appeal. The Swiss representation still reserves the right to ask you to appear for a personal interview after checking your visa application. 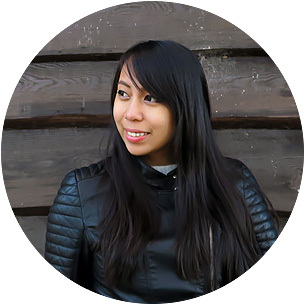 Ideas for your Eurotrip itinerary! See ALL of my Europe articles here. It’s not required, but it’s good practice to provide one. ◘◘ How much money should I show in my bank account? Most of the Schengen member countries would need you to show that you have at least EUR 50 (Php 2,500+) per day of your stay. You can use this as a standard and this is the bare minimum, that’s why I suggest that you add way more money to it if you can. ◘◘ What if my plans change and I won’t be visiting some of the countries I indicated in my travel itinerary? Can I still travel to those other countries with my Schengen Visa? There is no border control within the Schengen Zone, so yes — you can deviate from your original plans BUT only for as long as they’re within the Schengen member countries. ◘◘ If I am invited for an interview by the embassy, what are the usual questions that they will ask? Your background: proof of strong ties with the Philippines, your job, your financial capacity, etc. Details & purpose of your trip: to where are you going to, why you’re going, how long, where you’re staying, etc. Your travel history: if you’ve been to the Schengen area before, if you have relatives/family there, etc. Of course, the questions may vary depending on your circumstance but generally, there really are no difficult questions since they only want to know more about you and your trip. So just be honest and concise. Applying for a Schengen Visa via the Swiss Embassy is easy, and I hope that with this visa guide, I can help you prepare your documents and requirements better. Let me know how it goes! Good luck! If you’ve already applied for a Schengen visa before, how was your experience? Single means as is: you only enter the Schengen area once. A multiple entry visa allows you to go in and out of Schengen unlimitedly within the time frame they provided. So it depends on your travel plans. If you just want to visit Schengen areas like France, Italy, etc. then single is enough. But if you want to visit France and then make a stop to UK for example (which is not part of Schengen) and then go back to Italy etc. then you would need a multiple entry visa. This is the exact answer to all of my queries..As a dreamer to step on the land of the one and only Switzerland,and a first timer.This info's is perfect...but,soon...I'll be going to apply my visa here in Riyadh.However,this is the Philippines base, still very helpful for me. Thanks Aileen this is so helpful!!! Hi Aileen, about getting a travel insurance, should I declare all the countries i want to visit? Upon checking the world nomads site. There is a question "Which countries or regions are you traveling to?" or its okay if I put Switzerland only. TIA. It should be fine, usually at the checkout it will show you the countries excluded (which is usually your home country and the USA — unless you want USA included). Hope that helps! Hi Aileen! I'm glad I found your blog post on this topic! :D I have a question though, for the copies of documents do I have to have these docs certified by a lawyer? Or are regular photocopies are accepted? Thank you!